The façade of the brick structure at the corner of Lincoln Way and Sacramento Street in Old Town Auburn was a crumbling wreck in January 2001 when local officials deemed the building unsafe to occupy. Leaning an estimated 12 inches out of plumb, the 150-year-old brick facing of what was once the Union Saloon, was ordered demolished. There is no question the building was very, very tired and drastic action needed to be taken to salvage this historic edifice. In recent decades, virtually the only maintenance performed was done on an emergency basis, and the interior had been abused by a string of tenants. It seems no one really cared about the old Union Saloon. Actually, it is amazing the building still stood. For most of the Depression and for many years thereafter, the building was vacant. During this period, Old Town Auburn was reduced to being little more than a skid row. It wasn’t always a down-and-out place, however. On the Plaza, about 1920 with the Union Saloon upper left. From the advent of the Gold Rush in 1848 to the new millennium, Old Town Auburn has often been a good-time enclave for eating, drinking and rowdiness. After gold was discovered in Coloma, just 14 miles from Auburn, what is now Old Town became the terminal for shipping ore out and goods and “services” in. The town was teeming with rough-edged characters-some seeking their fortunes, others squandering them in the saloons and numerous “sporting” houses. When the Transcontinental Railroad was built in the 1860s, the population swelled with Chinese laborers and Union soldiers posted in the area during the Civil War. After a fire ravaged Auburn in 1855 destroying some 80 buildings in its wake, primary construction of commercial buildings went from wood framing to brick. The building that would become the Union Saloon, at what was then the corner of Sacramento and East Street, rose out of the ashes as a fashionable and ornate edifice, with a gently curving front in sync with the roadway. Other than property records and an occasional advertisement in the Placer Herald, the county’s leading newspaper at the time, reliable information about the building is scarce and often contradictory. Attempting to trace the building’s lineage through County records is frustrating because of changes in the spelling of names and the way the property is described. Also, the name “Union Saloon” was probably used by other watering holes at different locations. 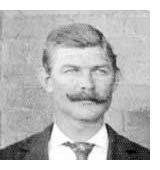 This tavern has also been known as “The Round Corner Club” and, in the 1920s as the “Yocum & Dependener Saloon,” or simply “Yocum & Dip’s.” The second half of this partnership was Frank “Big Dip” Dependener, a legend in Placer County who served as a county deputy sheriff from 1891 to 1928. At six-feet, seven-inches, Big Dip was a formidable figure and the tallest man in the region. With his saloon just steps away from the county’s courthouse, there is little doubt his establishment was frequented by lawyers, judges and law enforcement officials. Big Dip, whose story is told separately on this site, was killed in an auto accident in 1928, and the fortunes of the bar declined. No doubt the impact of the Depression hit Auburn as hard as the rest of the country in 1929, and from a photo taken in 1934, the place appears to have been shuttered. It seems that after 1932, when film star Mary Pickford purchased the back and front bars (see separate story), the days of the Union Saloon were truly over. 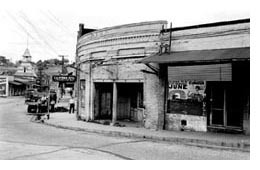 For the next 50 years or so, the building was either vacant or used sporadically, such as when it was Luken’s Mortuary or home to a Bea’s Diner in the 1950s. Most recently, 1568 Lincoln Way was occupied by Kalman’s Jewelry, which relocated to a storefront on Lincoln Way in Downtown Auburn when the building was condemned in 2001. Before that it housed a restaurant, a coffee shop, antique stores and an interior design shop. No doubt there were many more tenants over the years. The building was saved, in large part, due to the efforts of Auburn Building Inspector Wayne White. A city employee for 40 years, White orchestrated efforts to compel the building owner to rebuild the structure’s façade. The extensive work included replacing the sidewalk vault in front of the building and retrofitting with seismic bracing. When completed in February, 2001, the exterior was beautiful, but the interior was a disaster. Few people could see the potential in the space, but Laura and I jumped at the chance to go for a lease, even though we knew we had a formidable road ahead of us. It turned out to be an awesome amount of work. We started by ripping out all of the old drywall and tearing down the lath and plaster ceiling. We ripped out an interior A-frame structure that a previous tenant had installed, along with miles of old and unused phone and electrical cable. We removed literally tons of junk and construction debris from the Wine Mine and back passageway. All told, what we disposed of weighed more than seven tons. Perhaps the biggest challenge was rebuilding the rear shed that now houses our janitorial closet and rest room. We gutted the structure, tore out the floor, poured new footings and sistered in new framing. New water and sewer lines were laid, and we poured a new concrete floor. Then we hung drywall and installed all new plumbing fixtures, cabinets and flooring. Unbelievable. The rest of the store was the same. New doors, new swamp coolers and heater, new carpeting and on and on. At the same time we renovated tired facilities, we tried to retain as much of the old fabric as possible. We revealed old brick walls, a worn Douglas fir strip floor, and beautiful full dimension Douglas fir beams studded with ancient square-headed, hand-forged nails. We kept all of it. For something different, we responded to the pitch of a local tradesman and agreed to have two walls in the store surfaced with crushed Italian marble, creating an old Tuscan wall look. Then we built from scratch all of the Redwood wine racks in the store and installed special metal wall racks from Wine Master Cellars of Boulder, Colorado. The crowning glory was the design and installation of a new bar that replicates the original removed by Mary Pickford in 1932 (see separate story in History). It was built by Cecil Saunders of Grass Valley and is an astonishing piece of work. The Moffat family did much of the work, from demolition to framing to finishing activities. We also tapped into some very talented local craftsmen for electrical work, plumbing and carpentry. My brother, Don, spent nearly a month with us, lending his expertise in all areas of renovation. He did some incredible work, especially installing a new front door to the store. We started the renovation in April and finally opened the store in mid-August, with work continuing for another month or so on the Wine Mine. We still have another project out in back where we plan to rip out the floor in the Wine Mine and the concrete in the passageway. Then we’ll install proper drainage and lay pavers so that the surface is all on one level. Of course, we spent a ton more money on the project than we anticipated, and a small coffee shop we opened never got legs so we shut it down last December. Otherwise business has been good, and we anticipate being in this for the long haul. Whatever happens to our business, however, the Union Saloon is a solid structure once again and ready to serve.